This not-for-profit website is supported by community members that support the "Heart Park" vision as "the highest and best use" of the AES Power Plant site. This vision, and the group that supports it, is a direct result of the "public process" that the Redondo Beach City Council sponsored over the last year. We are now at a place where the people of the city will be given the opportunity to vote on their preferred vision for this area. Congratulations to the people of Redondo Beach, and to all of the people who helped in the dissemination of the true and honest facts and information regarding the Heart Park vision! Option A received over 55% of the public vote, with some provisional ballots still to be counted. The Following Candidates ran under the "Slow Growth 4 Redondo" slate. 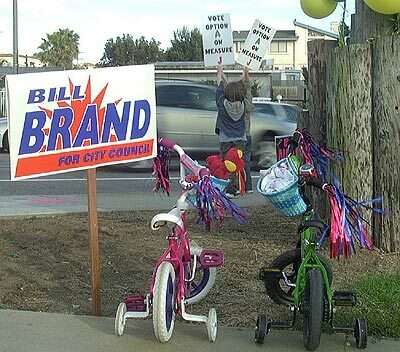 Mayor: Mike Gin is leading, with both Ellen Allan and Gerard Bisignano is in a close race for a run-off position. City Council District 1: Jim Light will likely be in a run-off with Steve Aspel. City Council District 2: Chris Cagle appears to have won against Bill Brand in a 44.3% to 55.7% race. City Attorney: Dave Wiggins is likely to be in a run-off with Mike Webb. 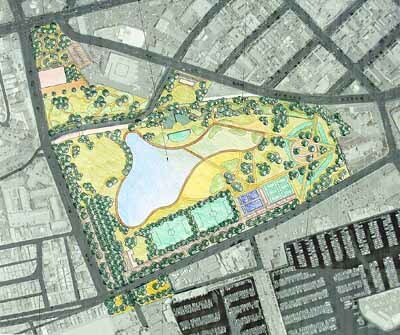 City Measure J: Select A - The Heart Park vision was selected by a 55.3% to 44.7% ratio over B - The Village Plan vision. To see the current Election Results posted on the Redondo Beach City Site, click here. There is other District/Precinct-related information available there as well. Note - You will require Adobe Acrobat Reader to read the results document. If you need the Adobe Acrobat Reader, click on the picture to the right. Where would you like to go (click on subject line to go there)? Current: Be sure to vote on March 8th - and vote for the "Slow Growth 4 Redondo" Slate !! Also: "Many Mommy March" on Friday, March 4th Was a GREAT SUCCESS!! And: Setting the record straight on two recent communications. honk support. Bring your family!! vision, feel free do download the information we have available. 01/16/2005: "Vote for A on Measure J" to tell the CIty "The Park is the Way"
Be sure to vote on March 8th - and vote for the "Slow Growth 4 Redondo" Slate !! The election on March 8th is probably the most important election Redondo Beach will see in our lifetime for commitment to Parklands and Open Space. This is a unique opportunity to really put pro-public / pro-open space people in office. 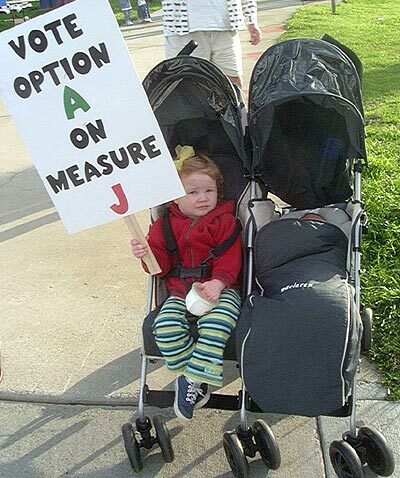 And, of course vote for "Option A on Measure J" to support he Heart Park Vision. Everyone in the City has a vote in this. Everyone can vote for Ellen Allan for Mayor, Dave Wiggins for City Attorney, and for "Option A on Measure J". Although Districts 1 and 2 have current candidates that are pro-park, other Districts can mobilize to get future candidates that are pro-park and pro-open space in their future elections. Tell your friends and family to get out and vote. This election is much more important than the Cagle/Zager battle for District 2 two years ago. 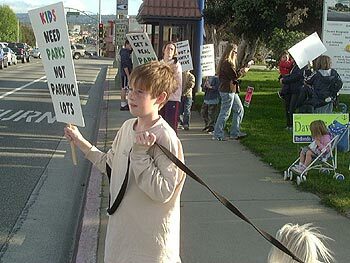 "Many Mommy March" on Friday, March 4th Was a GREAT SUCCESS!! 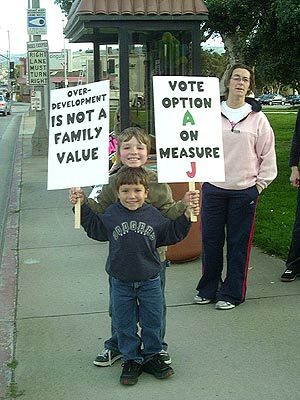 Friday afternoon, March 4th, 2005, dozens of people made their statement for "Option A on Measure J" - supporting the Heart Park vision for consideration of future use of the AES plant site. 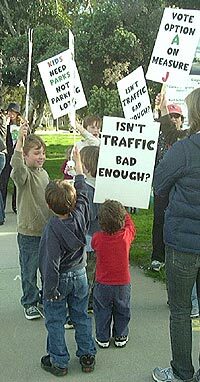 For over two hours, Monthers, Fathers, and Children of all ages walked the corner of PCH and Anita/Herondo showing their support of the "Real Park" vision for the AES site. Some brought "Man's best friend". Making sure each other are aware. Head and shoulders above the pack. Taking time from play for an important venture. And yes - it was fun! The crowd continues to hang on. How could anyone deny this face (or her sibling) a real Park? 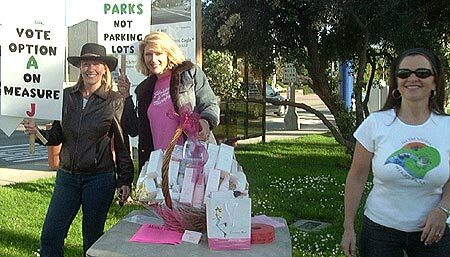 Thank you to everyone who participated in this wonderful event, and a special thank you to organizers Julie Hogan and Barb Blackstone, those who donated food and beverages, the signs, and to Andrea Conrad for the cool Mary Kay gift basket! ATTEND THE MANY MOMMY MARCH FRIDAY, MARCH 4th !! What else: Food and drinks to be provided, plus a raffle for a $500 gift basket !! This is a wonderful opportunity to get out and show your city that you support the Heart Park Vision! All Mom's and their kids are invited, as are Kids of all ages (as in you Dads and Singles). For more information: Call Julie at (310) 486-1901 and/or download the flyer ManyMommyMarch.pdf. If you need the Adobe Acrobat Reader (to read the flyer), click on the image to the right. CONTINUE TO SUPPORT THE PARK! YOU HAVE ANOTHER CHANCE TO WALK WITH US AND DISTRIBUTE DOOR HANGERS !! THIS SUNDAY, FEBRUARY 27th, 2005. COME BY AT 619 SOUTH BROADWAY BETWEEN 9AM AND 11AM !! If you'd like to help out by walking at some later date/time, please Email: support@heartpark.org. You Heard the Experts Talk About the Heart Park Vision, Now "Vote for A on Measure J" March 8th !! 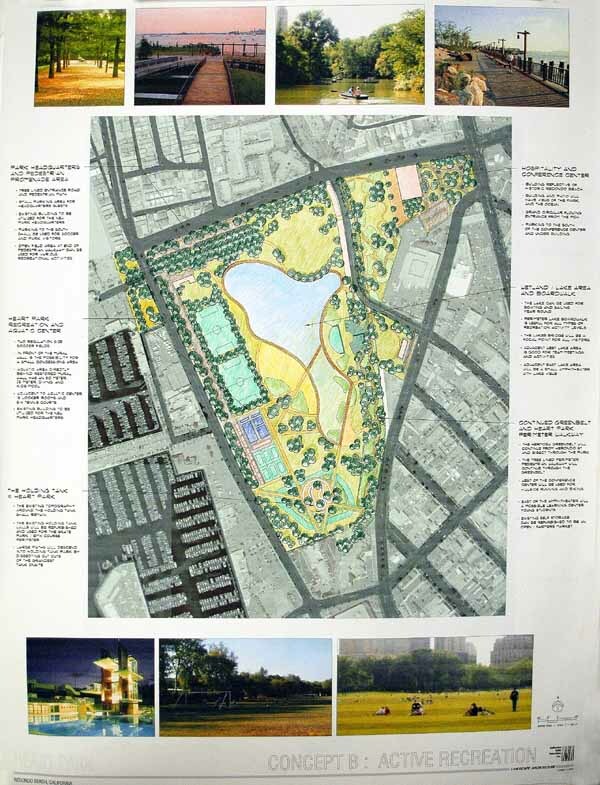 This could be a park on the current AES site - you can vote for it on March 8th, 2005! "Vote for A on Measure J" to tell the City "The Park is the Way"
On MARCH 8, 2005, Redondo Beach Residents will have the oppotunity to tell the City of Redondo Beach whether they'd like to eventually have a Park at the AES Power Plant site (option A), or have more homes and hotels with a small community park (opton B). Your vote for the Park is essential as this vote is non-binding (the City may ignore the results in it's plans if it so chooses), and the greater the community voice is preferring a Park, the greater the pressure will be on the City to meet out the public will for a Park. The Park option has been known as the "Heart Park" vision that is the result of the City-sponsored community consensus-building plan. The other vision is the "Villlage People Plan" which proposes hundreds of new homes, two new hotels, and a very questionable (from an engineering and cost perspective) set of water canals located 20 or more feet above sea-level, which will end up being the back-yard for hundreds of homes built on them. The following is an architect's rendering of what could be contained in the "Heart Park" vision, including sports and recreation areas, wetlands restoration, walking paths, community activities center, ample parking, and much more. THIS IS VERY IMPORTANT - PLEASE GET OUT AND VOTE ON MARCH 8, 2005! Redondo Beach residents Jim Light, Bill Brand and Don Vangeloff have all contributed to create this enlightening and thought-provoking perspective. It is based on what is known as the DTA (David Taussig and Associates) Fiscal Analysis of the proposed "Heart Park" and "Village Plan" alternatives for the AES site if and when the Power Plant goes away. This analysis was sanctioned and funded by the City of Redondo Beach with the approval of the City Council for $50,000. Note - This is a very large file should you want to actually download and save it from the City's website (7.9Mb). The actual report starts on page 9, and is preceeded by standard Council Agenda paperwork, plus a letter from one of the proponents of the Village Plan. You may optionally go to the City Council's Agenda page for the meeting of October 12, 2004, then clicking on the link on the first line of Item 5 - "Discussion Regarding the Taussig Report..." by clicking here. "...it would be very very difficult to, to (sic) vote on one plan or two plans without having some some idea of what the cost of those plans are, uh granted some of the costs are preliminary, granted some of them are based on assumptions...". "...if no money is available, which is a worse-case situation, what exactly is this gonna cost the city general fund?...". Both of these quotes, along with others, were made verbally during his presentation, but are not recorded in the actual report. The authors of the Perspective document at above left have found that the DTA Fiscal Analysis is lacking critical information that would be very important to a concerned public. 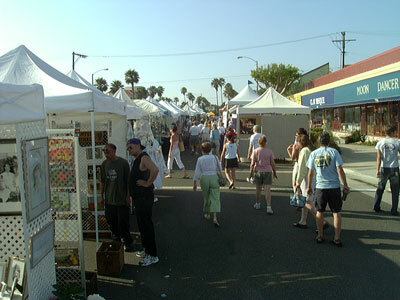 For example, impacts on traffic congestion and requirements for Public Schools are absent, costs and funding sources for acquisition and services are either loosely estimated or left out entirely, and the study bases its recommendation strictly on the loosly-identified costs and funding, without any consideration given to other intangibles such as "quality of life" issues for Redondo residents. Please consider downloading and reading the "Perspective" piece above - and linking to and read the actual DTA Fiscal Analysis as well. Reading both should be very enlightening. For more information and further updates on the status of the activities of the "South Bay Parkland Conservancy", go visit http://www.southbayparks.org. This 501-C(3) non-profit organization was created in order to promote more parklands for the South Bay. 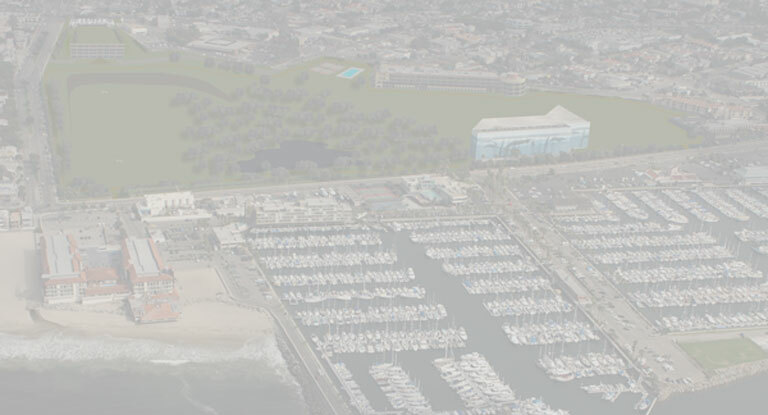 Redondo Beach is the most "Park Poor" city in all of the South Bay (even including Hermosa Beach). The City of Redondo Beach recently passed a resolution mandating that the City acquire over 50 acres of new parklands over future years. Coincidentally, the AES Power Plant occupies approximately that amount of space. For more information and further updates on the status of the activities of the "South Bay Parkland Conservancy", please visit http://www.southbayparks.org. This park, or one of similar vision and use, is possible. "Friends of Heart Park" is working very hard with the community and others to help make this park a reality. Such a park would be a tremendous asset to the community, and would benefit countless people for years to come. This is in sharp contrast to many in the community who would want to believe that such a park would not be cost-effective, and that the only economically viable use for the area would be for residential and/or mixed use residential and commercial. This area can be a park. The other vision is the "Village Plan" (aka "Village People Plan") which consists of luxury residential homes, townhomes, hotels and commercial - much of which is along the shores of "The Canals of Redondo". The "Village Plan" has intensive residential and commercial development, and is dependent on redevelopment monies to make their project financially viable. The people that support the "Village Plan" vision have a website where you can check out their vision's information as they present it. Their site is located at http://www.thevillageplan.com. We believe that after reviewing their ideas, you'll be back visiting ours and ready and eager to help us make this park a reality. ***UPDATE*** Please read on - but before doing so - in September of 2004, a new non-profit charitable organization, the "South Bay Parkland Conservancy", was created by South Bay residents in order to promote more parklands in the South Bay - - - their first project being Heart Park (see above). Please consider visiting their site at http://www.southbayparks.org. This site will be regularly updated to educate and inform residents on the parks' progress, how people can help, and related issues and events as they come up. If you would like to go to the RedondoLife website (the Redondo Beach Community website - our current site-sponsor), click here. Thank you for visiting - please come back soon. 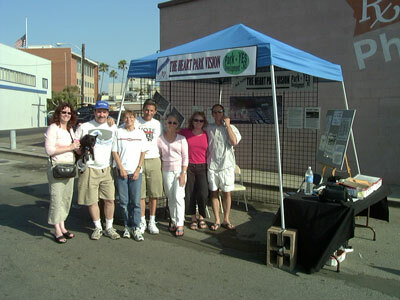 The "Friends of Heart Park" parked their information booth at the Hollywood Riviera Summer Festival Saturday and Sunday - June 26th and 27th, 2004. Many people stopped by to learn about the "Heart Park" vision. Although many had heard of the "Heart of the City" and it's eventual recision, not as many were aware of the 6-month process that yielded the two different visions for the AES power plant area. Nor were many aware that the City Council had committed to a vote on the issue - originally in November, 2004 - then rescheduled for March, 2005. Overall, people were very positive about the "Heart Park" vision, and many signed on to continue to receive information and help in the effort. Some of the "Friends of Heart Park" team pose for the camera at the end of the two-day event. Our "up-front" table had lots of information for those who stopped by. Overall, the festival was a well-attended event with lots to do and see. A walk through one concept of a "Heart Park"
The upper-left area bordering PCH is a flat garden that has an old Redondo Hotel-like building that can house events, wedding receptions, etc - maybe even a full-time restaurant. This building may also house park administrative offices (maybe some city?). The idea is that this area, with its spectacular views, can be used for many types of events  with parking available in the subterranean structure immediately below it with a western exposure. The top levels of the multi-storage garage can be reserved for special events parking. Access to this parking garage (also intended as general parking for the park) is via one-way streets in and out of the garage. The entrance is via a right- or left-turn off Catalina onto a one-way Gertruda, which goes behind the Post Office and into the garage. The exit is out the other side of the garage to a right-turn-only onto Herondo. Parking may be charged if feasible. Between the parking structure and Harbor Drive is a multi-use field with the soccer goals visible. This field can be used for many different sporting events - hopefully with sufficient space on each side for observers. You'll note that there is a retaining wall at the east end of the field so that the field can be flat while the grade is accommodated. Other ideas for this wall are to make it a tiered wall - allowing for another amphitheatre venue (see Wyland Wall below), and/or have part of it as a "climbing wall" for climbing recreation, maybe even stairs for more direct garage access and/or exercise. On the left side of the soccer field you'll see a 'path' that goes up the hill, flanked by trees. This is a path that goes around the whole park perimeter to be used for walking a dog, jogging or just strolling. It may also have "stops" for excercises so it can be used as an excercise path. You can see it all the way around - and it exists between the Wyland Wall and Harbor Drive (in that area). Next to the soccer field is the "forest" where picnics can be enjoyed in the shade. There is also an optional pond or salt-marsh visible through the trees. To the right of the forest area is the Wyland Wall. This can serve as a covered-stage amphitheatre. It can also hold a marine studies center, limited recreation facilities. It should also be large enough to provide space for administrative offices and/or maintenance-storage space/offices. To the right of the Wyland Wall is a large grassy area that, along with the area behind it and up the grade toward the pool, can be used for lawn-sitting, Frisbee-throwing, etc. This large open area could also host local events such as The Farmer's Market, Mardi Gras, Art Show/Exhibit, etc, etc. Note that the multi-use field (South of Heronda and East of Harbor Drive above) may also be used for special events. As you walk on up the grade from the "Mardi Gras" area, you'll come to the swimming pool/aquatics center and some (TBD) Basketball/Tennis/etc courts. There may also be a building or two in this area to support such activities if warranted. Of course, more trees may be added to block any undesirable sights from the park, and different types of trees (larger/taller ones) may be added in some areas for specific atmosphere or habitat. Also, other's view into the park (such as from the Salvation Army facility) might be a benefit to those worth considering. This particular vision preserves the Bank, Post Office and Tech Center, but does use the land where the storage facility resides. It also tentatively uses the areas where the Cannery Row Studios and Allard Designs are located for the pool/acquatics center and courts. This entire rendition is a first-blush - for concept purposes only. The following documents and links are available to Heart Park supporters, skeptics, and opponents - as well as those who would like to just get to know more information about the Heart Park vision. 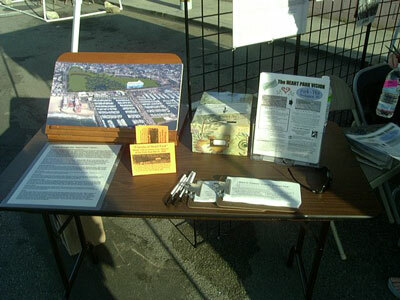 The information made available in this area is meant to show that the Heart Park vision is not only possible and viable, but that statistics and information presented by Heart Park proponents is of sound basis, and often from the City of Redondo Beach's own statistics tables and consultant studies. If you have a question that is not answered by any of the available information below, pleas e feel free to EMail your question to: questions@heartpark.org, and someone will get back to you. The documents below are Adobe "pdf" files, and you will need the Adobe Acrobat Reader in order to display the files. You may download the Adobe Acrobat Reader by clicking on the Get Acrobat Reader image to the right. Many organizations have been, and are continually involved in the restoration and preservation of wetlands on our southern California coastal area. There will always be those who will continue to pursue development, and development will always remain an option. The following sites can help you understand that there are programs, money and poeple out there who do care about restoration of these lands, and that this is entierry possible for Redondo Beach. Please visit the following sites at your convenience.